I rode mine with straps, maybe that has quite a difference? I didn't mean to challenge your skill. Sorry if it came across that way. 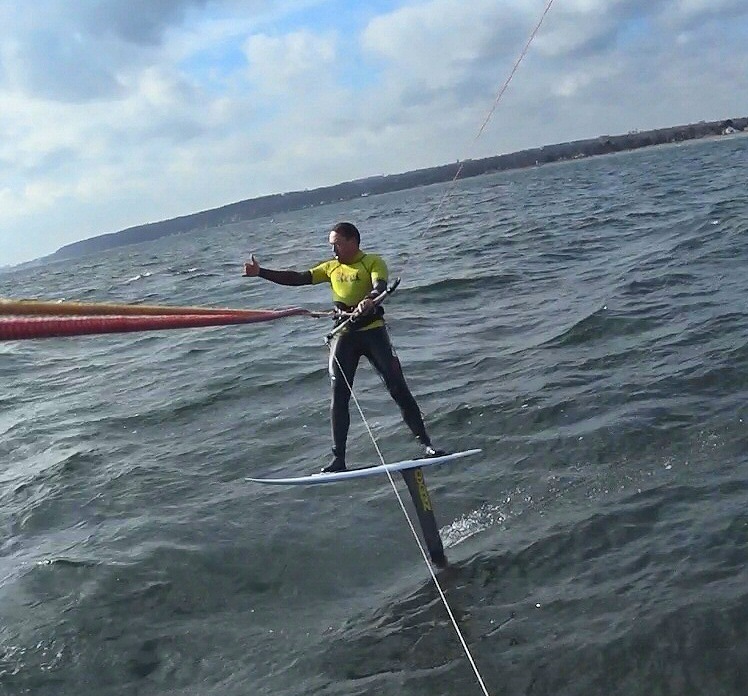 I learned on the Zeeko Makaira, the race wing and freeride wing. When going downwind and the kite pulls low and forward, you move your rear foot slightly back of course - but really relaxed. Found some old pictures that might show the difference from your stance ? Zeeko Makaira, beautiful and awesome ! And this shows my stance when in balance, seems to be further aft than your rear foot right ? Freaks? Hmm I thought I was as average as they come. I'll take it as a compliment. Not doing much long distance myself, but I concur with others that HF is a good platform for fast, yet relaxed cruising. As long as water is deep enough, not too much weeds or kelp and not too many fish to hit. Crashing every 5 minutes or so because of weeds or fish is no fun. Yeah, from your stance it looks like your are back foot bias. HF trim and stance is a personal preference, although it can change with time. I have studied my footage (where this was a screen-shot out of), and indeed what PF says seems to make the most sense! Indeed if I go upwind I move my COG to the front, and when going downwind (as on my picture) I move more aft. 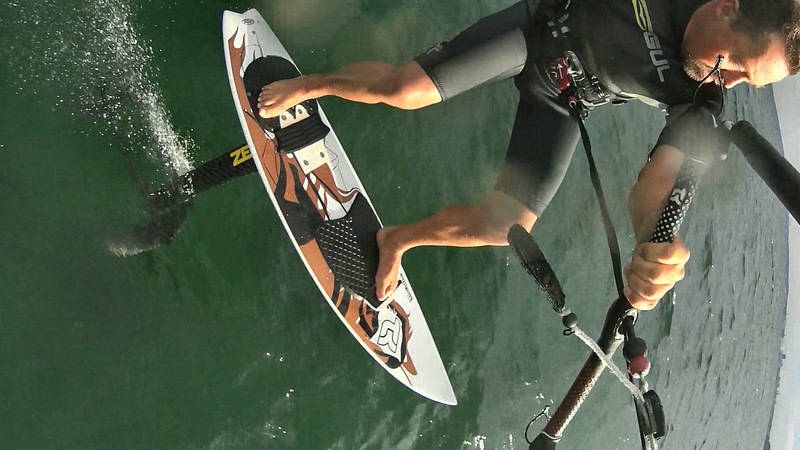 So it would make sense to move your feet a bit strapless, as I do on my wave-board as well when riding on different courses relative to the wind. I have the 2016 pocket board, where I reference the middle of all the strap inserts. There I place my feet. Maybe this does not match the 2014 Makaira any-more? But better to stop learning with a bad stance, so next time I will try to place my rear foot more to the rear! Unfortunately 5°C this morning, whereas the moment I took the picture it was 14°C at the beach last week. I guess I have to wait for better weather, hopefully next week. Peter Frank: your mast looks longer, which one did you have? I guess there only was two Makaira mast lengths, a short one and the "normal" one, and it is the 1m. Maybe because my board is quite small, the mast looks long ? first off all I have to say: I miss it too. As it has a good glide-ratio already at low speeds, I have never managed to reach again such high angles (see first-track-pic: green upwind-track-line) against the wind of much more than 45° degrees and thanks to stability being so relaxed on it. So to come back to the point, it is also great to do long distance runs with the Makaira. It is just not the fastest, which is one point why I changed to Levitaz Aspect, which is perfect for distance and oldschool-Freestyle as well. Till now I just had runs with 80 km and as our lakes have just around 5 to 20 km of length, I often go upwind, downwind, upwind, usw.. Longest one way just 10 km till now. But I want to go for much more this year I think 100 miles in one day can still be done pretty relaxed. I want to try first back and return with one way 60 km in the next weeks a long a sea coast. On the other hand it is also great fun to just travel into every small edges of a lake as you can pass with a fast foil many lulls and lees which are unreachable with most other wind powered vehicles. Peter_Frank wrote: I guess there only was two Makaira mast lengths, a short one and the "normal" one, and it is the 1m. When I inquired for the board back in 2014, Nicolas recommended the short (80cm) instead of the long (95cm), which I initially wanted to have. Horst Sergio wrote: As this seems to turn into a: "How much did you like your Makaira Foil ..."
Wow, that is a nice place to go foiling! My friend from who I bought this foil also stepped over onto the Levitaz Element 3.0 for racing. 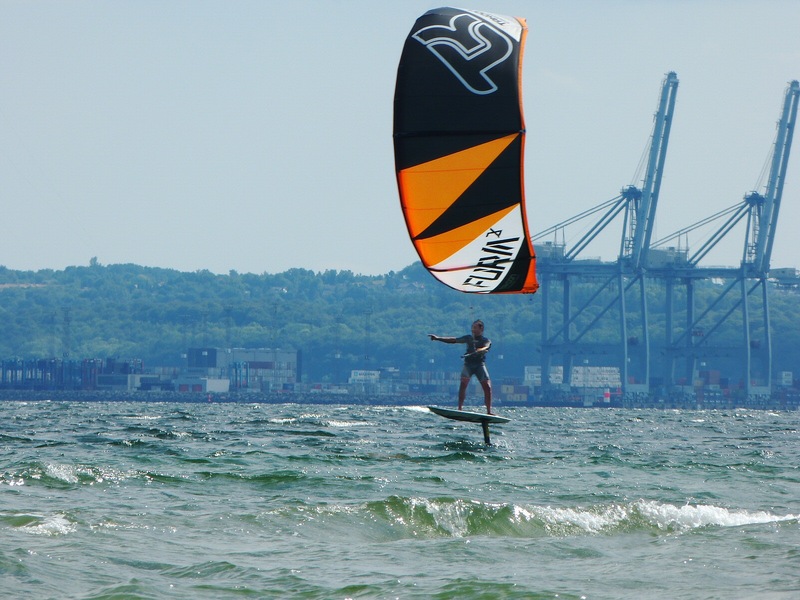 I can ride it without pain in any direction when I go with not much kite-power. But when powered up (and go faster) it starts to be a pain sometimes. I also hear that from other people on foils like the Mozes and other brands. I would like to know what I am doing wrong. I ride my Sword 2 strapless and perfectly balanced on both feet. Since you are also strapless one would think that all you should do when the speed increases and the front pressure increases with it , is to move both feet forward in order to regain that balance but on my Sword it is actually the opposite. As the speed increases I tent to move my feet 2 or 3 cm further back in order to keep a perfect balance. I therefore think you should try shimming your rear wing very slightly in such a way that it reduces its elevating effect. if that does not work (it should) you can also try a smaller back wing. We all know that a front wing on it's own will naturally want to dive. My theory is that the bigger the back wing, the more effective it will be in compensating this diving tendency and the more so the faster you go . You can fix that by reducing the difference in angle between the 2 wings making the rear wing less effective. A smaller rear wing will be less effective at high speeds and will not over compensate as much as a bigger one but will be less pitch stable at lower speeds. I had the opportunity to try your recommendation yesterday. 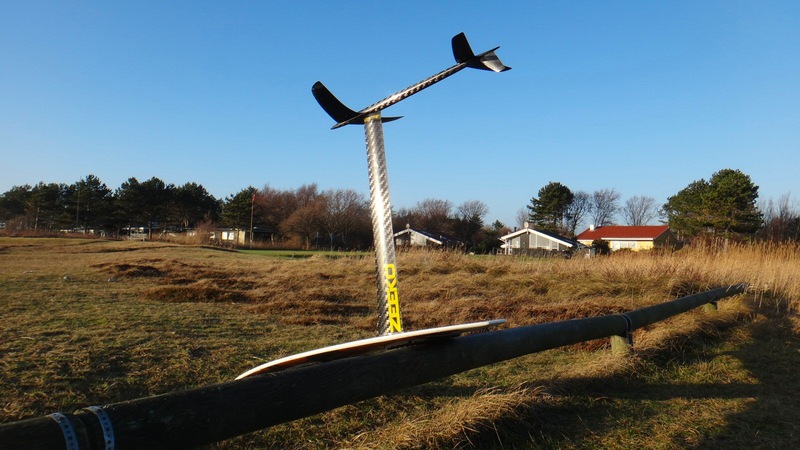 It was a 8-15kn session with a 8m LEI wavekite on 28m linelength. I tried to move my feet several times in order to test different stances. And I ended up with my rear foot at the farthest position possible, still on the EVA deck pad. So far I felt it improved my riding! Especially given the gusty wind (there was one other kiteboarder trying to get out on a flydoor and 17m LEI, and could not get upwind), the full onshore wind, heavy chop and 0,5m waves. I felt more into balance. I noticed I was standing straight instead of leaning to the rear, as is visible in my picture. Indeed it is better to change my stance and position in an early stage. Next time I will attach my camera again to make a new picture of my improved stance.